Asclepius, god of Healing, had many sanctuaries erected in his honour. However, amongst those the sanctuary at Epidaurus is arguably the most important. Not only because it was believed to be the birthplace of Asclepius, but also due to the variety of treatments it could offer within its large complex. The Asklepeion is an example of the typical health centre of the Ancient World. It is located amongst a haven of trees by a force of spring water within a secluded valley. It was a place of pilgrimage for many nationalities. There they would make sacrifices to Asclepios and purify themsleves before entering the abaton. Aside from incubation, pilgrims could also be given pharmaceutical drugs and remedies, they could even undergo surgical treatment, evident due to the scalpels, lances and other instruments found there. Dogs freely roamed the sanctuary and vistors with flesh wounds would allow them to lick their wounds as it was believed their saliva had curative powers. Indeed, modern research has found the presence of antiseptic agents in canine saliva. Though there are three accounts of the birth of Asclepius, the most straightforward myth surrounding him, is that he is son to Apollo and Coronis of Thessaly, born by his mortal mother in Epidaurus. His mother was rumoured to have had an affair with Ischys and in anger, Artemis killed her to avenge Apollo's honour. Hermes is said to have snatched a baby Aslepius from the flames of the Pyre. Hermes was said to have cut the boy from Coronis' womb, thus being named Asclepius, which means "To cut open" in Ancient Greek. he was raised by his father and educated by the celebrated tutor, Chiron the Centaur. Aslepius married Epitone, goddess of soothing pain. The two became parents to many sons and daughters, including Hygieia, goddess of health, and Panacea, goddess of medicines. 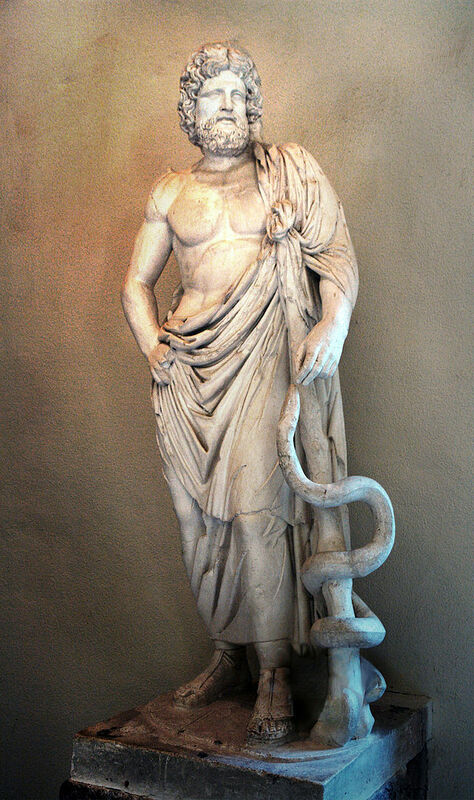 From a young age, Asclepius was gifted in the art of healing and as he became older, he started teaching medicine. There is a myth surrounding his death concerning his abilities to raise people back from the dead. Zeus recieved word that Aslepius had resurrected Hippolytus and in anger, he killed Asclepius with his thunderbolt. Apollo seeked revenge on the Cyclops that had made the thunderbolt, causing a rift between father and son. Zeus expelled Apollo from the sky and he resided in Thessely for a year, where he served their king, Admetus for a year. Once the year was over, Apollo was welcomed back into Mount. Olympus and Zeus made Asclepius a star in the Ophiuchus Constellation (The Serpent Holder). After death, Asclepius was recognised as the god of medicine, healing, rejuvenation and physicians. The main building found at the archaeological site was the Doric temple dedicated to Asclepius. The temple was six columns by eleven columns, which housed a cult statue of Asclepius which no longer remains. As the site plan shows, there are two alters next to the Temple of Asclepius. The earlier alter is large and would have likely been the alter used by the Greeks. The size of the alter is impressive compared to the size of the temple. It suggests that the religious ritual of the Epidaurians would seen the sacrifice of a large amount of animals, thus showing the popularity and volume of visitors of the sanctuary. The smaller, newer alter would have probably been used by the Romans, who also frequented the sanctuary. The abaton was used as a place of incubation for worshippers. This particular one was designed as a place for sleeping, so that those who had pilgramaged to consult Asclepius who be able to sleep and wait for the healing god to visit them in a dream, either showing them treatments to follow or curing them of their complaints as they slept. If in need of further treatment, i.e. surgery, the worshippers consulted the priests, who were guided by Asclepius' knowledge. 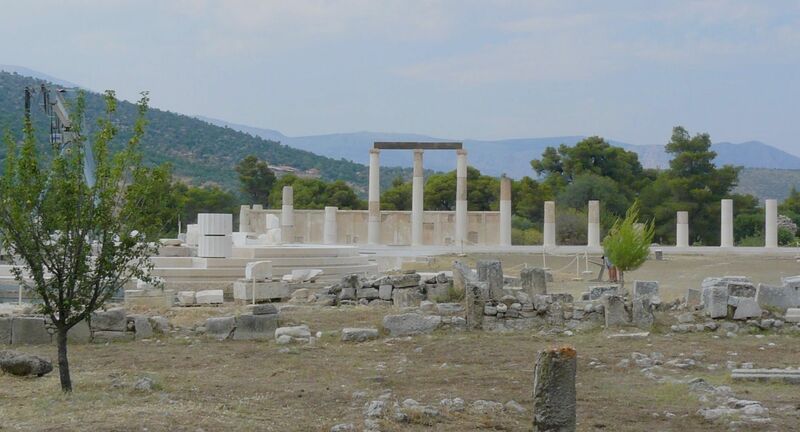 At Epidaurus, there is a tholos next to the Temple of Asclepius [as shown in photograph below]. The term tholos is Ancient Greek for 'circular building', which is often a smaller temple used in the worship of the god in which the sanctuary is dedicated to. This is a common feature in many of the sanctuaries all across Ancient Greece. 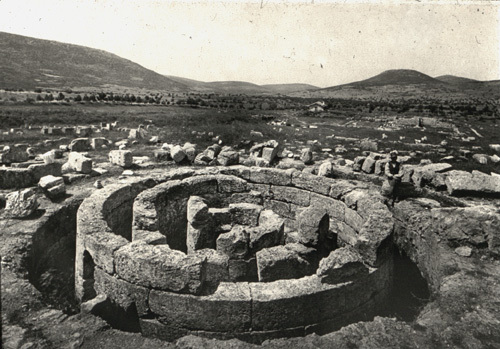 This particular tholos was known as the Thymele. Archaeologists believe that the tholos was the most importance building at the Sanctuary of Asclepius. It use is uncertain. It may have also been used as an abaton or a place for the priests of the sanctuary to eat. 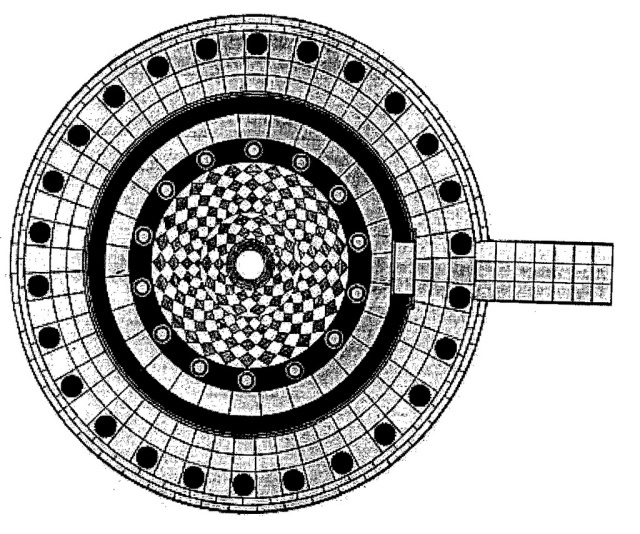 Nevertheless, this building is interest due to the subterranean maze which it housed. One could only speculate as to the purpose of this maze. It may have been a place where offerings were made to the gods of the underworld. Perhaps patients were left to wander the maze, potentially finding at its centre a pit of snakes. Some suggest the maze may have acted a form of shock treatment for particular psychiatric cases. At the Asclepeion, there was also a temple dedicated to Artemis. Perhaps her significance to a sanctuary of healing is that she was the goddess of childbirth, the protector of young women, and bringing and relieving disease in women. She is also the aunt of Asclepius. A small stone dedications of ears found in the Temple of Asclepius in Epidaurus. People would dedicate imagary of what body parts had been causing them problems - they acted as a souvenir to what had been healed as a token of "thank-you" to the healing god. Various examples of surgical intruments and dedications also found at the Temple of Asclepius, Epidaurus. These would have been used in healing procedures and treatments by the Asclepius' priests of the sanctuary. Figurines of Artemis found at the Temple of Artemis, Epidaurus. "A man came to the god as a suppliant who was so blind in one eye that he only had the eyelids left and there was nothing between them, but they were wholly empty. Some of the people of the shrine made fun of his folly in thinking that he could see when he had no trace of an eye but only a place for it. He went to sleep in the shrine and a vision apeared to him. It seemed to him that the god boiled up a drug, drew apart his eyelids, and poured it in. When the day came he went away, able to see in both eyes." Epidaurus was a small Ancient Greek polis located on the Aegean coastline at the Saronic gulf in a region which, post-Roman colonisation of Greece, became part of Argolis (also known as the Argolid). 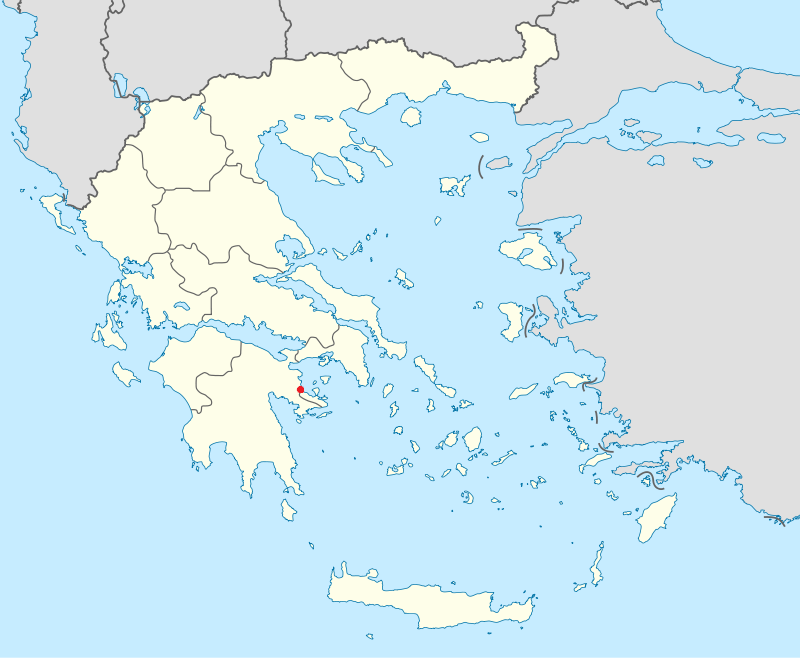 Argolis is one of the many regions that made up the Peloponnesian peninsula in southern Greece. 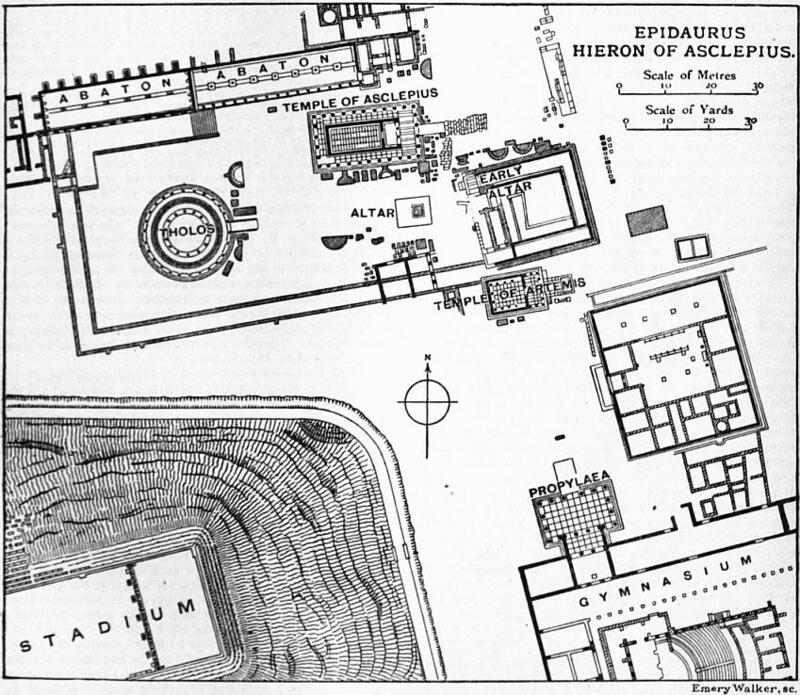 The picture below shows a site plan of Epidaurus. We can see the main Sanctuary of Asclepius. Next to the main temple, there are two alters. The larger one named the 'early alter' and the smaller named 'alter'. The site plan shows that not only was there a Sanctuary at Epidaurus built in the honour of Asclepius but there is also one dedicated to Artemis, and the tholos, just west of the Sanctuary of Asclepius. As well as this there is also the statium and the gymnasium south of the two sanctuaries. Important for maintaining health and recovery. The sanctuary would have held games, i.e. footraces , chariot races, etc, in honour of Asclepius (and maybe Artemis) within the Stadium. One may question the purpose of a theatre at a sanctuary of healing. However, according Aristotle's Poetics, tragedies dealt with the plot outlining the protagonist's reversal of fortune, evoking both fear and pity from the audience. This resulted in catharsis and thus the audience would be purged.